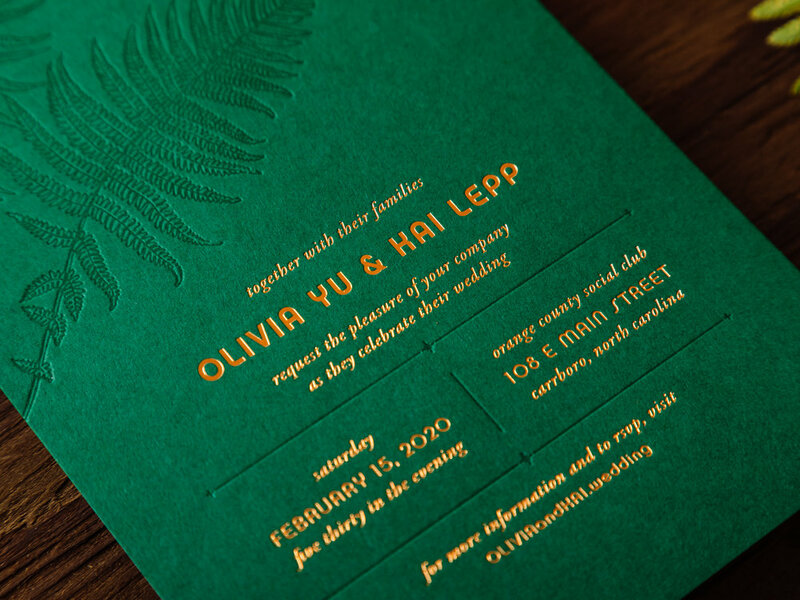 Tonal green-on-green letterpress with crisp copper foil, Fern is one of three new 2019 designs on our Parklife Colors paper. Great for island weddings, rainforest rehearsal dinners, deep woods baby showers, you name it. 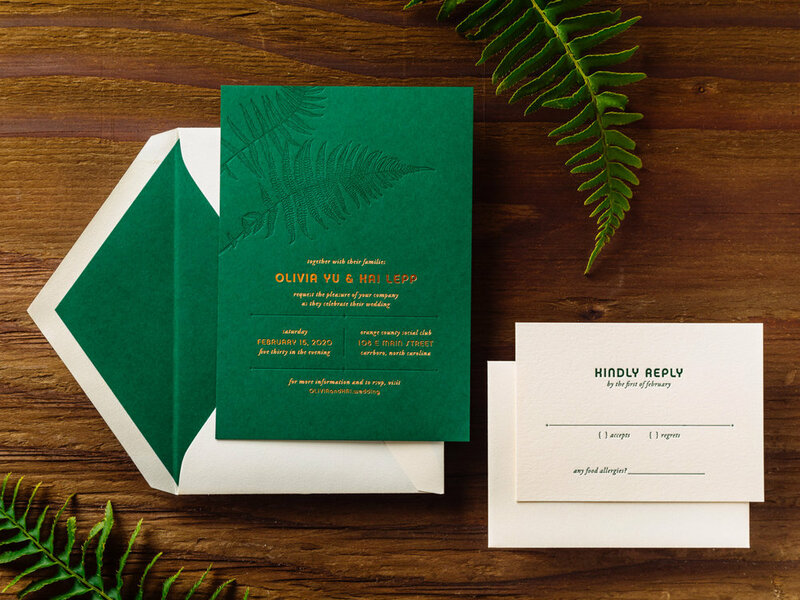 We like to pair the Forest green invitation with Ecru reply cards and envelopes for easier writing. 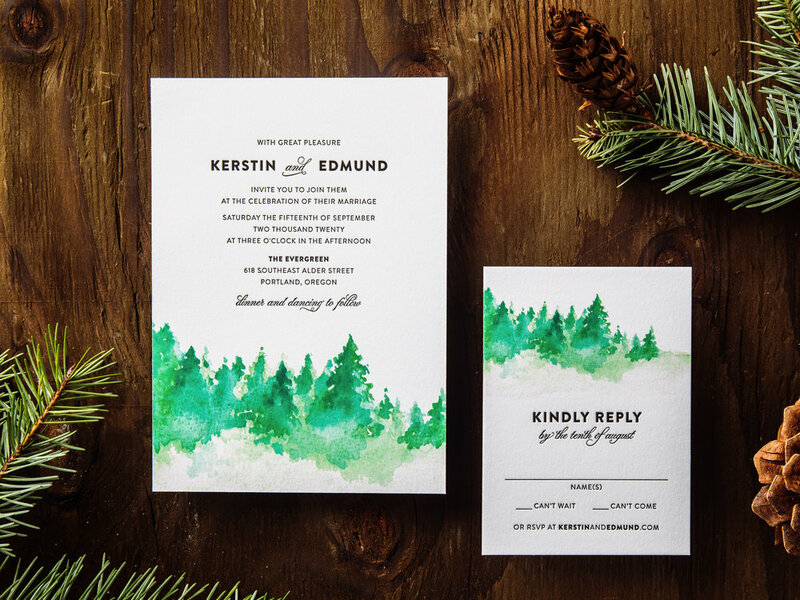 But if you prefer Forest paper and envelopes all around, that's an option too. Timberline pairs a soft matte inkjet-printed watercolor image with stark black letterpress type on our house cotton paper. Great for the Pacific Northwest, or anywhere pine trees are found. 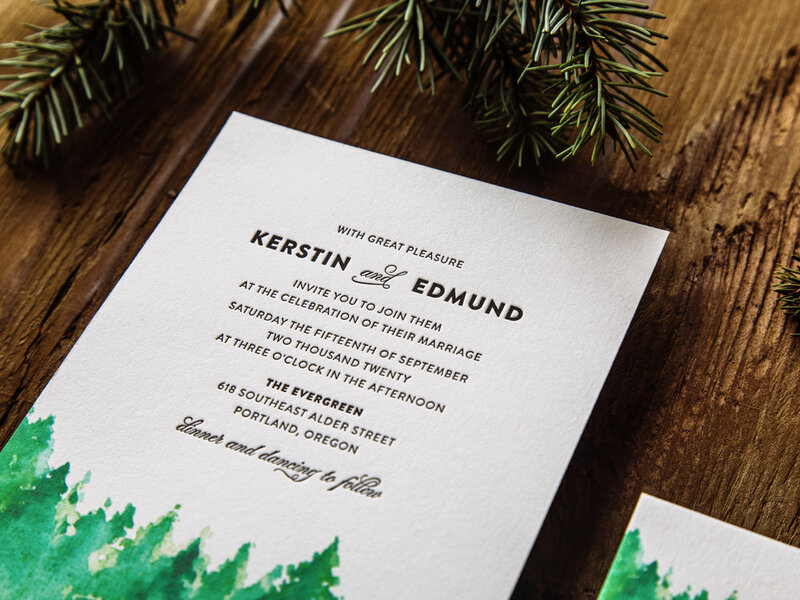 An inkjet run is priced the same as one letterpress ink, so the Timberline set is priced as a two-color design. 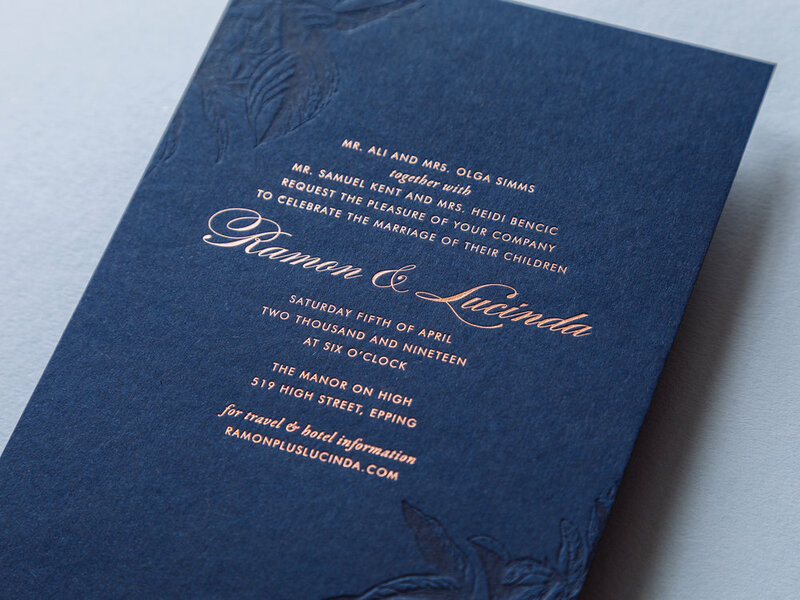 Tonal navy-on-navy letterpress cherry blossoms alongside rose gold foil text. This one can be adapted with other sorts of flowers too. Let us know what you have in mind! 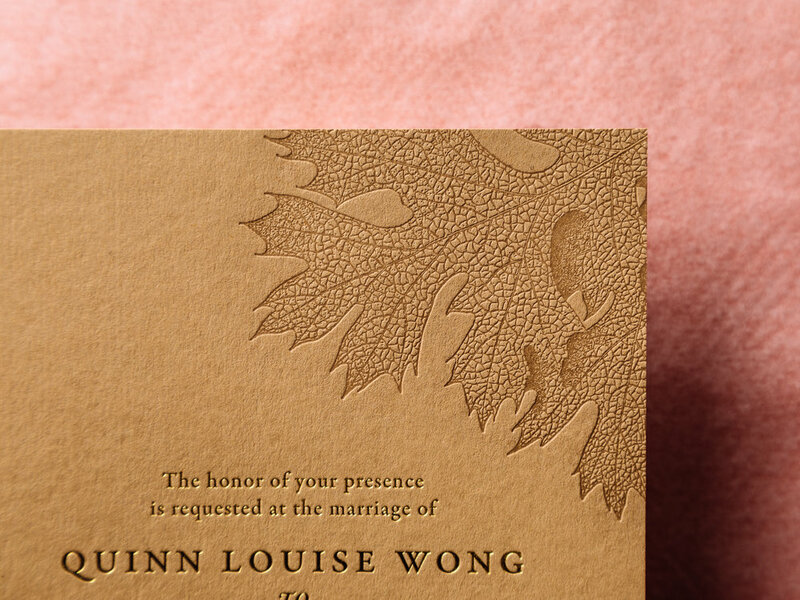 As with the Fern design, we can use either dark Parklife Colors paper or white cotton paper for the reply cards and envelopes (for easier writing). 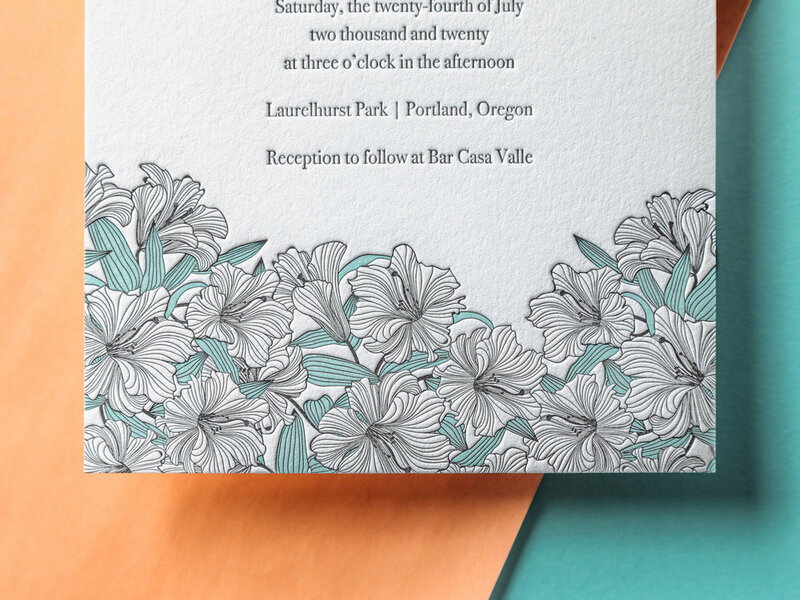 Airy, playful, and charming, our Veranda wedding invitation pairs nicely with any outdoor spring or summer event. If you like, swap out the seafoam ink for another light/bright color to suit your taste. Gold Shine foil and Dust letterpress ink on 300g Harvest paper. The detail in the oak leaf on this one is amazing! 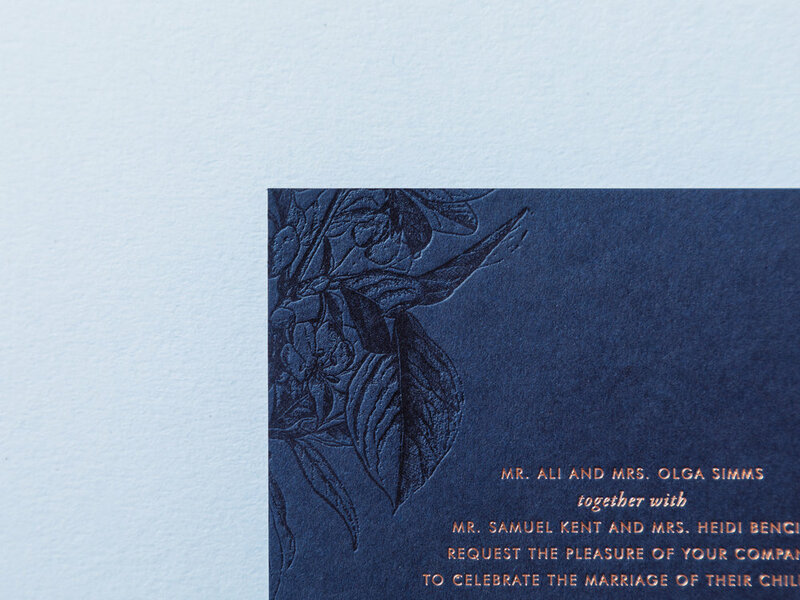 Harvest is lovely with gold foil, but can also be printed with letterpress ink (Cocoa, Espresso, and Black are great options) and you'll save a little money. We can pair these with Harvest-colored envelopes or with our white cotton envelopes if you'd prefer. 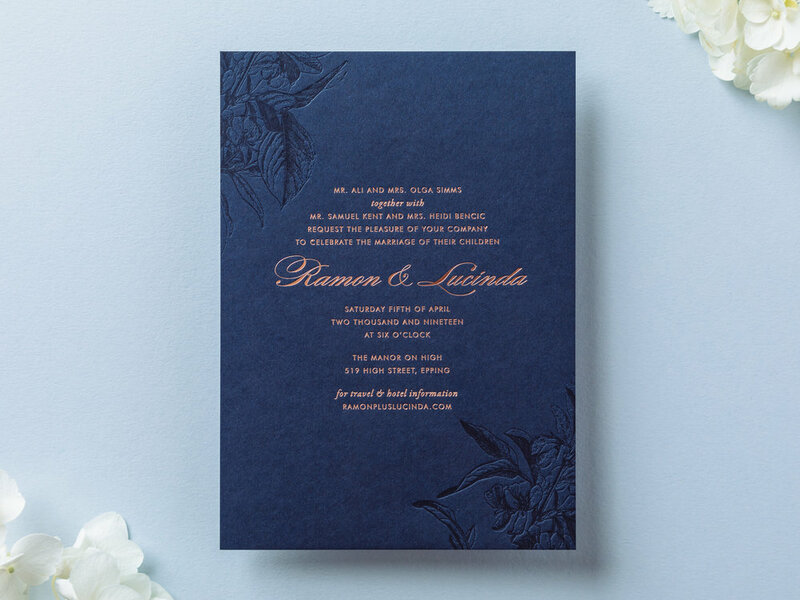 Posted in wedding invitations and tagged with wedding, parklife colors, harvest, imperial, forest, pearl white, fluorescent white, gold shine, rose gold, copper, reply card, envelope liner, slate, inkjet, black, ecru, nightshade, fern, veranda, timberline. April 4, 2019 by Travis Friedrich.